Many people find it both respectful and healing to visit the burial site of someone they loved. Flowers are frequently brought as a symbol of love, often left laying on the ground around the grave, though a lot of facilities take issue with this practice. Most of them recommend, or require, that visitors utilize cemetery vases to hold their devotions. A lot of interment facilities have begun setting strict rules as far as the type of floral holders may be utilized for practical purposes. First of all, the flowers will remain attractive for a longer period of time when placed in water. The right container will not only keep them tidy but will also stop them from being scattered by the wind. Grounds maintenance is another consideration that has led most facilities to make container stipulations. Certain styles make it much easier for those tending the lawn to keep the grass around each headstone neat and trimmed. Some degree of uniformity also lends an aesthetic appeal to the site when viewed as a whole. There are so many variations in the styles, designs, shapes, sizes and colors in which these products may be found. The choice should reflect the personality and preferences of the deceased when not required to purchase a specific model. The primary focus is that the product be made in a sturdy design and from a material that is durable to withstand exposure to the elements. 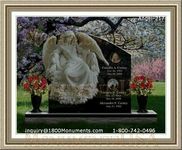 Shape is a matter of personal preference, though most people try to select something that matches the headstone's style. This part of the design will have no effect on how long the product will last. Containers may be of cylindrical, conical, squared, urn or custom made form. Container placement is another factor to consider when making a purchase. Putting the vase in front may block the information on the headstone, so it is generally recommended it be installed beside, or attached to the marker. Always check facility guidelines before making a purchase of this type.